In case you hadn’t noticed, it’s really, really cold right now. But if you’re in Britain, spare a thought for our friends across the pond who are suffering at the hands of the polar vortex, with the death toll rising to 21, at the time of writing. 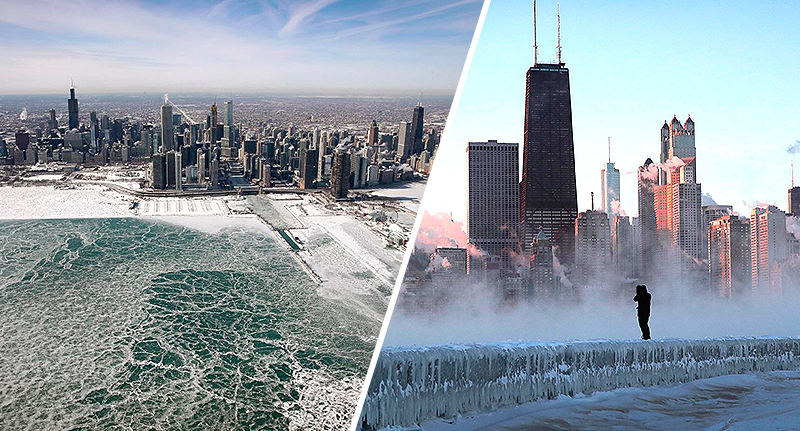 Amid fears for people’s health, the residents of Chicago are currently experiencing a particularly unsettling side effect of the extreme cold snap, with some reporting loud booms coming from underneath the Earth’s surface in the windy city. As the temperature in Chicago dropped to 23° below zero early on Wednesday morning (January 31) – one of the coldest readings ever recorded in the city – locals said they could hear rumblings and some even reported feeling shakes. Meteorologists have identified the noises as likely to be frost quakes. Also known by the geological term ‘cryoseisms’, the phenomenon occurs when a quick drop in the temperature leads to a fast freezing of material, which causes the rock or soil in the Earth to burst rather than just slowly expand, reports USA Today. While experts have said there’s no danger from frost quakes, locals have reported feeling fearful after not knowing where the noises were coming from, with some equating them to sound of gunfire. Others have reported thinking their homes were being broken into. However, Dave Call, a meteorologist at Ball State University said there’s nothing to worry about. He suggested residents simply think of the frost quakes as a similar reaction to putting a bottle full of water in a freezer and watching it expand quickly. Meanwhile, a hospital in Chicago has already treated 50 patients for frostbite, and some may end up losing a limb, CNN reports. Half of those patients were homeless individuals, while others had jobs that required them to be outdoors. Happily, the icy cold polar vortex is expected to loosen its grip today, Friday 1 January and by the end of the weekend, Chicago could see temperatures as high as 10°C with a potential 60° swing for the Windy City residents. Elsewhere, Iowans like Taylor Scallon will be happy to hear the news after her hair froze in the nippy chills. In Iowa the biting cold caused Scallon’s wet hair to freeze and stand upright, tall above her head, and she shared the results in a now-viral video on Twitter. The short clip shows Taylor standing in the doorway of a house giggling, clutching two blankets. Unable to stop laughing, Taylor looks up to her hair which looks like it has been fixed in position by the strongest hairspray known to humanity. Alas, hairspray was not necessary that day thanks to the cold. Let’s hope the warmth settles in quickly.